How many endings are in the 2013 edition of The Stanley Parable? There's already a question asking this for the original Stanley Parable game. But now that there is a new, shiny version of the game on Steam, how many endings does it have? And which endings are "new" to the new game? In the mod, this is where the 'life' ending goes, but that's gone elsewhere and this is completely different. Nothing similar is in the mod. Follow the Narrator's instructions until you reach a path labelled 'escape'. Take this path instead of entering the Mind Control Facility. 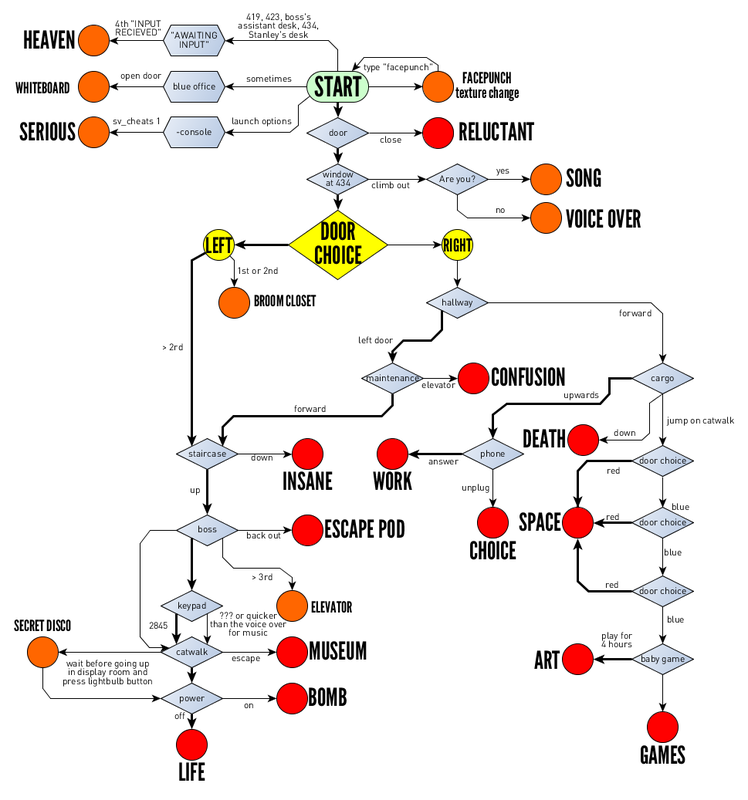 This is analogous to the 'down the elevator' path in the original, but is greatly expanded upon. There's also, arguably, The Whiteboard Ending and the Broom Closet Ending, but these don't actually end the game. Let's start this off with the endings I've already found. Spoilers on, of course. Don't leave your room at all, just close your door at the start of the game. You'll probably get this ending by accident if you pause the game and click back in at some point. Your reward is insecurity in your own actions. The ending that the narrator 'intended' you to have. Simply do everything you are told. Go through the left door, ascend the stairs, enter the secret room, ignore the exit, and turn off the machine. Your reward is the outdoors, and an actual achievement. Take the door on the left, but walk down the stairs instead of up. Your reward is your own dementia. My personal favorite ending so far. Take the door on the right, then take the first door on your left, then take the lift down. Your reward is a very long, very confusing ending that at least has the decency to name itself. You just lost it. Take the door on the right, go straight forward, ride the lift, and then jump off onto the catwalk below. Take the blue door 3 times. Your reward is incredibly obvious parody. Oops. Take the door on the right, go straight forward, and jump into the pit. Your reward is a quick but painful death. There is a second version of narration to go with this if you step onto the platform and off again, letting it go on without you. Take the door on the right, go straight forward, ride the lift up without falling, then answer the phone. Your reward is being trapped in a mundane office job. Take the door on the right, go straight forward, ride the lift up without falling, then disconnect the phone. Your reward is being a real person! So far, I count eight endings, with at least two being like or very similar to the endings from the original game. There is a list of endings being written on the Steam Forums that is mostly complete. You can find it here. As The Game ending (door on the right, go straight, jump off the platform, blue door three times), but play the Narrator's "baby crawling into fire" game for four hours, as the Narrator says. Note that after an hour or two, the Narrator will add in his "puppy falling into a pool of piranhas" game. You must play both games simultaneously. After four hours, you will get this ending. If you don't want to go through all that, here's a video of what happens. Sometimes when you restart, you'll be in a grayer office. When you leave your office there will be about 8 doors or so and you would normally progress by walking around a section of filing cabinets. If you try opening some of these doors, one of them will open and will be a small room that only has a whiteboard and on it in red marker it'll say "the whiteboard ending". When on your way up to the boss's office (before you go up the stairs) you'll find a door labeled "Broom Closet". Go inside and wait. After the dialog finishes, exit the broom closet, then go back in. After this, the next time you play, the broom closet will be locked up. Not so much an ending as it is an easter-egg. Play through the game doing exactly as your told except on the last choice, turn the machine "on" instead of "off". A "Final Boss" fight will ensue where you have to push certain buttons to defeat the Narrator or do nothing and succumb to a nuclear explosion. Follow the narrator until the top of the stairs. Instead of going left into your boss's office, go into the doors on the right and go in the elevator. If you press up or down, nothing happens other than the elevator shaking and playing music. Note: This "ending" is only attainable if you go through the Escape Pod ending. The next time you go to the boss's area, you can go in both the executive bathroom and room on the right. Counter-Note The "ending" is randomly attainable btw. Most of the time on your third time to the boss's office. Not the answer you're looking for? Browse other questions tagged the-stanley-parable or ask your own question. How many endings are there to original The Stanley Parable (2011)? What is the code for the mind control room in The Stanley Parable? Does anything happen if you don't obey the commands to press buttons? What does this note say in the Stanley Parable? 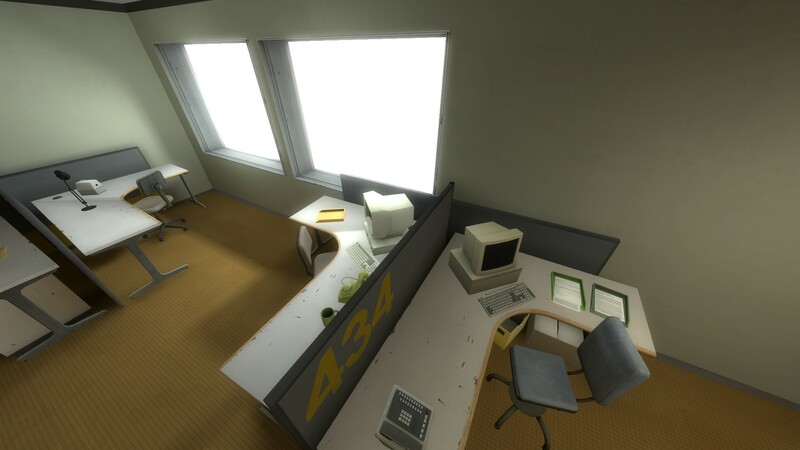 Are there multiple endings in The Stanley Parable demo? What files to move if I want a clean slate? Does the “Go outside” achievement keep track of time across machines? How did I get the “Unachievable” achievement?